Heritage Center for you and your family’s enjoyment. Marvelous Musical Report of the Marine National Monuments, The Shipwreck Wheel of Misfortune, My Haggan Dream, Riddle in a Bottle, and The Shark Riddle. First Robotics Tournament Event #2: Happening this weekend at the Alpena High School. Qualifiers from last weekends round will compete again to see which teams move on to gain a spot at the Michigan First Robotics Competition State Championship. Northern Lights Arena: Glow Skating, Roller Skating, Ice Skating, Sticks & Pucks- so many options to keep everyone busy while burning off some of that spring fever energy. 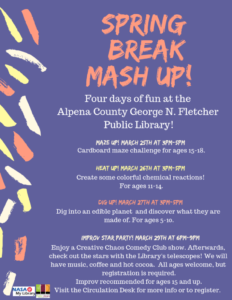 Spring Break Mash Up at George N. Fletcher Public Library: Four days of fun await your kiddos for the Spring Break Mash Up! Get involved in the Heat Up (a colorful chemical reactions experiment), a Dig Up (discover what an edible planet is made of? ), and an Improv Star Party (a creative comedy club show!). 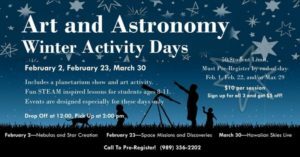 Art and Astronomy at the Besser Museum for Northeast Michigan: This weekend’s Art and Astronomy session focuses on Hawaiian Skies Live: Still feeling the winter blues? Warm up a little as you learn about the special tropical ecology of the Hawaiian Islands! Being so much nearer to the equator, the night sky is sure to look a bit different too! Thunder Bay National Marine Sanctuary: There’s something for everyone at the TBNMS Heritage Center! A great place for family fun while you explore shipwrecks in real time via live video feeds, discover the Great Lakes’ rich maritime past through innovative exhibits, and learn how underwater archaeologists work to preserve historic shipwrecks. 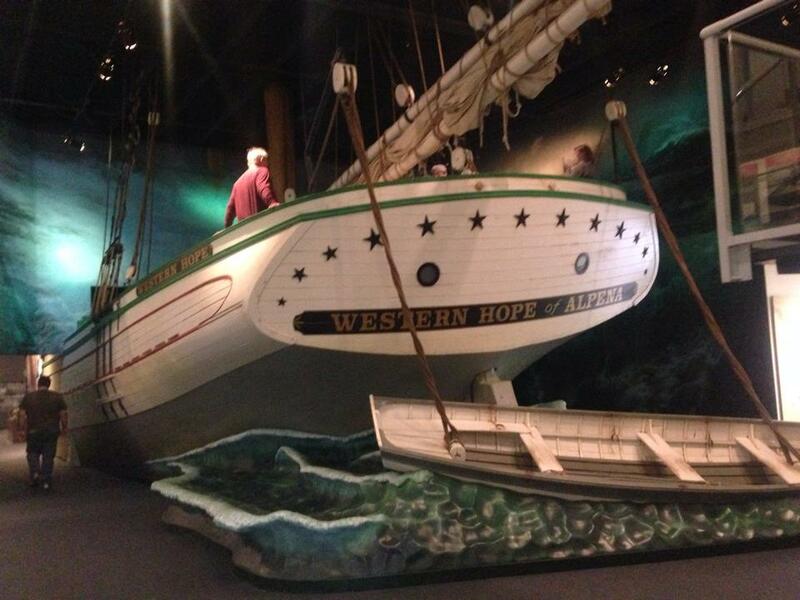 The “Exploring the Shipwreck Century” exhibit features a life-size replica of a portion of an 1800’s Great Lakes Schooner, a re-creation of a shipwreck site, artifact lab, and hundreds of learning opportunities. Gallery to check out their featured artwork. Who knows, maybe you will even find that piece to go perfectly in the dining room! Family Night Out Cardio Glow Drumming: Release all the pent up winter energy and join in for a fun hour of GLOW Cardio drumming! This month’s theme will be Disney songs. All ages are welcome. Limited supplies, so don’t wait to reserve your drum today! Laser Team Challenge- Extreme Laser Tag: Incredibly fun, team-based laser tag, located in the National Guard Armory in Downtown Alpena. Games are played both inside the armory and outside in the woods. A great way to have fun, develop teamwork, and be active! Find more information on their website by clicking here.